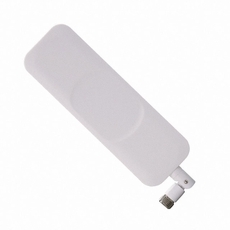 The hinged Apex II TG.35 Ultra-Wideband Dipole Antenna has been designed to cover all Cellular, ISM and Wi-Fi working frequencies in the 700-6000 MHz spectrum. Evolved from the already highly successful Apex TG.30, this second generation has the highest wide-band efficiency in its range of any terminal antenna on the market today. The Apex II has been primarily designed for use with 4G LTE modules and devices that require the highest possible efficiency and peak gain to deliver best in class throughput on all major cellular (2G/3G/4G) bands worldwide for access points, terminals and routers. High efficiency is vital for applications such as high speed video and real-time streaming, or high capacity MIMO networks on public transportation.